It takes just under two hours to drive from home to Stillwater Reservoir west of Yampa, Colorado. I started my hike up the North Derby Trail by 9:20. 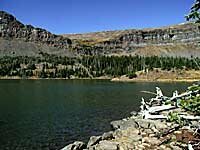 The trail climbs from 10,280 feet to a pass at 11,200 feet where it becomes Hooper Lake Trail and starts back downhill on the south side. I'm not sure why the name changes but the pass is on the line between two ranger districts and two national forests. I was there by 10:30 and it was another 45 minutes to Hooper Lake at 10,864 feet. You can't see the lake from the trail and I momentarily lost the trail, going too far downhill before climbing back to the lake. There was some fresh snow around but nothing to impede the hike although the trail near Hooper Lake was not clearly visible, apparently. After having lunch at the very scenic Hooper Lake I went on down to Keener Lake, less than half an hour away on a short side trail. 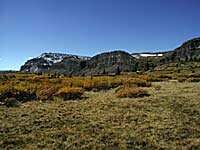 Both lakes sit at the bottom of the 400 foot cliffs below and north of Derby Peak. I could stay there and enjoy the views all day. 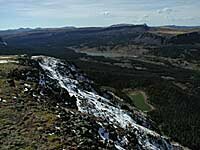 After taking pictures, I decided to skip my planned visit to Edge Lake and climb Flat Top Mountain instead. I left Keener Lake by 12:30 eying the mountain to the northeast at 12.354 feet. Taking a short cut toward the mountain without going all the way back to the pass, I was well up on the ridge by 1:30 and had nice views of Edge Lake, Hooper Lake and Stillwater Reservoir. From there, the climb to the summit looked pretty long and I really had to convince myself to continue, saying I would give it up if I didn’t reach the summit by 2:30. Missing that deadline by 10 minutes, I reached the summit at 2:40. It was very windy at the top but there was no rain in sight so I set up my tripod and shot a panorama. I left the Flat Top Mountain summit shortly after 3:00. It was a beautiful afternoon and very picturesque, so I took my time and lots of photos heading down the ridge toward the pass between North Derby Trail and Hooper Lake Trail. I saw only five other people all day and was back to the car by about 5:45. Click here for more photos and descriptions of this hike.